Because the accumulator is integrated into the frame of the baler, the baler's current maneuverability is maintained. 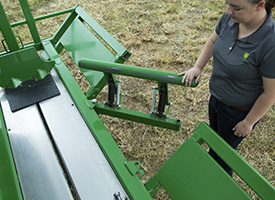 Current solutions in the market are towed behind the baler, making it very difficult to back up or make tight corners around the farm. Tow-behind solutions require a more proficient tractor operator and more looking back at the baler and accumulator. 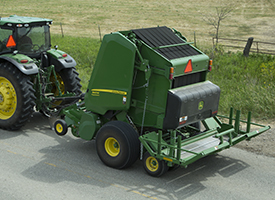 The integrated design of the Plus2 increases productivity for producers who bale on hills. This allows for bales to be ejected on any landscape, saving baling time in hilly conditions where operators have to travel or jockey the baler to drop bales. This will minimize or eliminate losing bales down hills. Finally, the Plus2 provides the operator with an easy line of sight to see how many bales are on the cart. Visibility to the cart is easily accomplished by looking in the mirrors. There is no required additional expense for another monitor or camera (camera system is available as aftermarket kit). The bale sensing switch is in a position to detect the bale once it has exited the bale chamber. This assures proper transfer from baler to cart. Since the transfer arm is directly connected to the gate via chains, allowing the gate to open fully with a bale in an incorrect position could result in a bale getting stuck in front of the transfer arm. If there is no bale in the chamber and the gate is opened, the gate will only open to approximately 40 degrees. 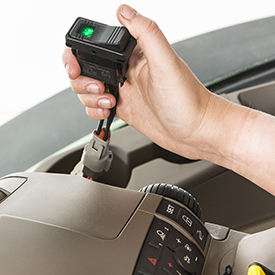 The wiring harness for the Plus2 has an override switch located in the cab of the tractor that is used when the gate needs to be opened for servicing the baler or accumulator, when the bale chamber is empty. Once that switch is activated, the gate can be opened to the full height and it will not disrupt the sequence of the slider. 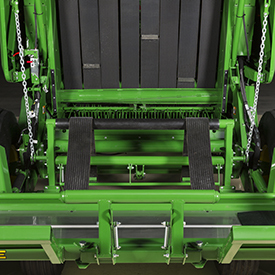 The bale damper arm, located on the rear of the cart, absorbs the energy of the bale as it is transferred. 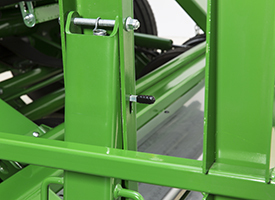 This feature keeps the bale on the cart at inclines up to 16 degrees. The bale damper can be swung open to gain better access for net loading and service. It is critical that the damper arm is reassembled properly after being opened. If the damper arm is not locked back into the operating position when baling resumes, it can be torn from the cart on the first dump. A spring-loaded latch keeps the wings in for transport and makes unlatching for field use easier. The wings need to be manually extended and retracted. The wings on the Plus 2 need to be extended for field use and retracted for transport. In the transport configuration, the accumulator is no wider than the baler. 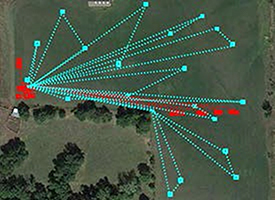 This is important when transporting between fields, through narrow gates, or down the road. Red bales depict where the bales were placed with the Plus2 Round Bale accumulator. Blue bales depict where each of the bales were wrapped and would have been placed with a traditional non-accumulating baler. 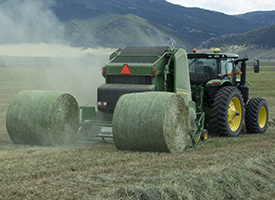 In today’s round baling operation, where the operator finishes wrapping the bale is where the bale is ejected. 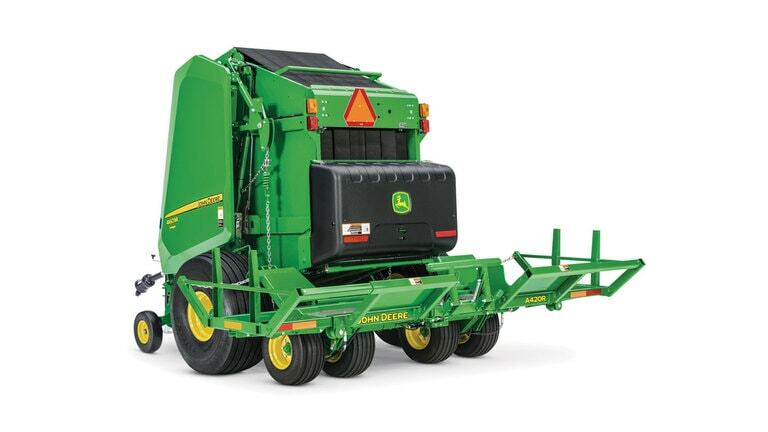 The John Deere Plus2 Round Bale Accumulator changes that. The Plus2 Round Bale Accumulator allows the operator to carry up to two bales while making a third. 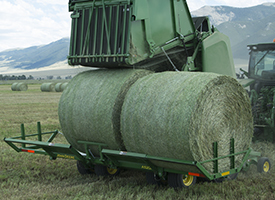 This means that bales can be placed in the most strategic location to get them off of the field as quickly as possible while minimizing wheel traffic. Before producers begin baling with the Plus2 Accumulator, it is important to have a plan. The bales will no longer be randomly scattered. 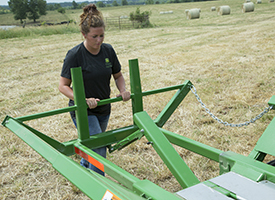 To maximize the Plus2, having predetermined accumulation sites will not only decrease bale removal times but will increase yields for future cuttings. John Deere provides two very significant values to the producer who utilizes this machine. The first value of accumulating bales is time reduction when getting the bales off of the field. 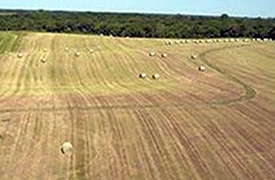 In another factory-observed trial, an 8.1-ha (20-acre) field was baled with a traditional baler and balert with a Plus2 Accumulator attached. There were 25 bales made with the traditional baler and 26 with the accumulator. Distance traveled to move the bales to a central storage location in the field with the traditional baler was 4,013.6 m (13,168 ft). The accumulated bales only needed 704.1 m (2,310 ft) to get to the same location. That is more than an 80 percent reduction in total distance traveled using a loader tractor hauling two bales at a time. The second value of accumulating bales is the reduction in wheel traffic and the damage that excessive wheel traffic causes to regrowth. Round bales have the luxury of being able to stay in the field longer than square bales, and there are times when round bales sit in the fields longer than most producers like. Numerous university studies have proven that wheel traffic on regrowing alfalfa from the fifth day it was cut can cause a decrease in yields by 20 percent. The Plus2 Accumulator minimizes unnecessary wheel traffic by allowing the operator to reduce travel when getting the bales off of the field and into storage. Plus2 also reduces operator fatigue. 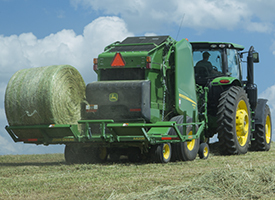 When baling in hilly conditions, there is no longer a need to leave the windrow and jack knife the baler to prevent the bale from rolling away. Operators can accumulate bales on the cart and dump at the predetermined, flat location. Growers do not have to worry about rolling bales through the fence or into the pond. In areas where the fields are irrigated, the Plus2 allows the operator to get the bales off of the fields faster so the water can be turned back on sooner. It also reduces unnecessary trips across pivot wheel tracks, terraces, corn rows, and other field obstructions. 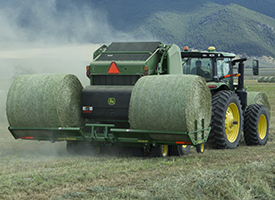 Accumulating bales with the Plus2 reduces wear and tear on machines like bale stackers, self-loading wagons, and loader tractors. Running a 7, 8, 9, or 0 Series Baler with a Plus2 Accumulator provides a very similar baling experience for the operator as it was prior to the accumulator thanks to the alternating hydraulic slide. 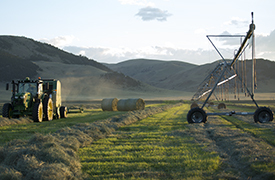 Once the bale is wrapped, the gate is opened and the transfer arm moves the bale to the open position of the cart. When the bale is slid onto the cart, then the gate will close. 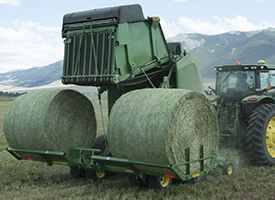 The only time added to the overall cycle time is the sliding of the bale which takes approximately 2 seconds. 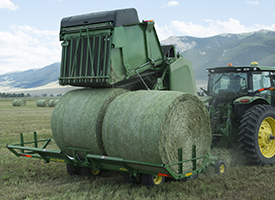 In order to maximize efficiency, the Plus2 Round Bale Accumulators are able to place or dump the bales from the cart while the tractor is moving. The third selective control valve (SCV) controls the dump functions of the cart. When actuated, the entire cart tilts, dumping all bales that it is carrying at that point. 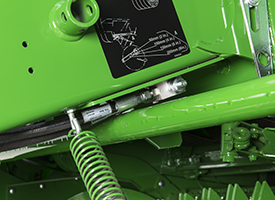 This patented feature is able to get the rearward speed of the bale to match the ground speed of the tractor by adjusting a valve under the tongue. The end result is a bale that stops still in the field as the operator continue driving forward. When dumping on the go, the speed at which the cart tilts affects how much the bale rolls when it hits the ground. Faster ground speed while baling requires a faster cart dump speed.